A thing that I talk about with Myra is how I'm always blowing a gasket because I've overscheduled myself again and how I'm always overscheduling myself because people love you if you do things for them, and then I say no to things and actually have time to think and be elated about doing things for myself, and then if I have more than two days to think, I get sad. Presumably I am thinking about how people don't love me. It's terrible how sad I am, thank god I'm so funny. But seriously—serious face—it could be worse, I could do things for people and not get loved. I mean, right? We wouldn't have the words "thankless task" otherwise, but I always feel thanked. Well, yay! I know nice people! But I did indeed stay home instead of going to Milwaukee for Brew Ha Ha, and I wish there was a joke for decompressing like there is for old musicians never dying, just decomposing; but I guess there isn't. But I am, decompressing I mean. I rode my bike to breakfast with shoalmate Zombea Arthur, I forgot what it was like to ride your bike on a summery day without fifteen pounds of gear on your back, totally wonderful. 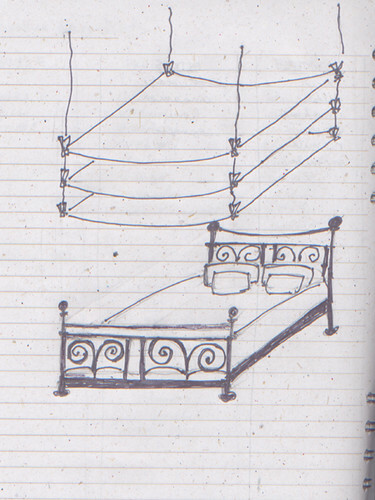 Then I invented this great contraption for making the bed when I was making the bed! I mean, I invented it in my head. Not actually. So like, you clip the bedspread and the blanket and the sheet to the clips and then you pull them up with a pulley (not pictured). So then they air out all day, and then you lower them when it's time for bed again. Just to show that I'm not totally detached from reality, this is the Ikea Noresund bed; you can look it up. Actually, you have to hear the story about this bed. So this is the bed that I got when I moved out on my own and the day that my bed was supposed to be delivered, I had planned a whole list of things to do during the delivery window, which was from eight to noon, to keep myself from thinking that the bed wasn't going to be delivered. Because I have trust issues. But instead at eight I dragged my blanket out to the couch and just sat under the blanket, feeling dreamy. Get up Munt, I say to myself two hours later. Do something. Take out the trash, at least. So I get up from under my blanket, putting my cell phone in my pocket for the bed people who are undoubtedly halfway to Mexico with my bed. I put on a pot of coffee. I bag up the trash, and then I get ambitious and break down all the cardboard boxes. I unlock the back door to my apartment and lock it behind me with my key and go down the stairs and peek out the side door of the building. The trash cans are supposedly in the back yard, which I've never seen. The back yard is piled with loose bricks, like piles of brick as high as my waist. I find the trash cans amidst the brick and put the trash in one of the trash cans, and I go back for the boxes. I go out with the boxes, and for some reason this time I close the side door of the building firmly behind me. You know where this is going, right? So I put the boxes in the trash can, and I go back to the side door, and of course, it's locked. I have locked myself out of every building I've lived in and also out of every vehicle I've owned. But ha, I have my key in my pocket. I used it to lock up my back door, remember. Only my key doesn't work on the side door, it's a different key. That I don't have. That is not fair. Ha ha, the front door. Only I haven't been out the front door today, and the chain is still on inside. At this point, I know without a doubt that my bed will be delivered as promised. The delivery guys show up about ten minutes later. I have them put the bed in the little well in front of the garden apartment. I should mention it's December. Not the worst December ever, because I'm outside in a sweatshirt and two t-shirts and long underwear and jeans and socks and slippers—no coat—but still. I bang on the neighbors' door, I leave two messages for my landlord, and then I call my ex-husband. "We finally got a car that you couldn't lock yourself out of," he says mournfully, not to mention that we disabled all the locks at home that could lock behind me. "What are you going to do?" "Well, if my neighbors come home and if I don't freeze to death by four, you should come over and help me move my bed into my apartment." Luckily, it's not that cold. If it gets too much, I can walk over to the internet cafe in my slippers like Vinnie the Chin. I mean, I have my wallet. I can buy shoes and a coat from K-Mart, if I want. I'd rather not leave my bed unattended, but who's going to steal a whole bed? Though I distinctly remember hearing on the radio that it's supposed to rain starting this afternoon. About an hour later, I bang on the neighbors' door again. They've actually been home this whole time. So I go through their apartment and down the back stairs, and I try to unlock the back door to my apartment—and my key doesn't work. This is the one moment that I really give myself over to rage: I locked this door with this key! Is it a different key to unlock the door? Oh wait, I went down too many stairs; this is the garden apartment, this isn't my back door. The bed slats are in a little bundle, nothing to carry. The bed sides are in a long box, but manageable. The mattress, though, up two flights of stairs into my apartment, all by myself. It's like an ant carrying a sandwich. I'm hulking up to get the last box with the headboard and footboard when the neighbors come out and their friend helps me carry it in. I say to myself cheerfully, putting on another sweatshirt over my sweatshirt and two t-shirts, All's well that ends well! And that really seems to mean something when it starts to rain at about four o'clock.